Home » » How Ken Saro Wiwa Died. How Ken Saro Wiwa Died. Kenule Beeson "Ken" Saro-Wiwa (10 October 1941 – 10 November 1995) was a Nigerian writer, television producer, environmental activist, and winner of the Right Livelihood Award and the Goldman Environmental Prize. Saro-Wiwa was a member of the Ogoni people, an ethnic minority in Nigeria whose homeland, Ogoniland, in the Niger Delta has been targeted for crude oil extraction since the 1950s and which has suffered extreme environmental damage from decades of indiscriminate petroleum waste dumping. Initially as spokesperson, and then as president, of the Movement for the Survival of the Ogoni People (MOSOP), Saro-Wiwa led a nonviolent campaign against environmental degradation of the land and waters of Ogoniland by the operations of the multinational petroleum industry, especially the Royal Dutch Shell company. He was also an outspoken critic of the Nigerian government, which he viewed as reluctant to enforce environmental regulations on the foreign petroleum companies operating in the area. At the peak of his non-violent campaign, he was tried by a special military tribunal for allegedly masterminding the gruesome murder of Ogoni chiefs at a pro-government meeting, and hanged in 1995 by the military dictatorship of General Sani Abacha. His execution provoked international outrage and resulted in Nigeria's suspension from the Commonwealth of Nations for over three years. Born Kenule Tsaro-Wiwa, the son of Jim Wiwa, a forest ranger and his third wife, Widu. He changed his name to Saro-Wiwa after the Nigerian Civil war. His father's hometown is the village of Bori, Ogoniland whose residents speak the Khana dialect of Ogoni language. Saro-Wiwa spent his childhood in an Anglican home and eventually proved himself to be an excellent student; he received primary education at a Native Authority school in Bori, then attended secondary school at Government College Umuahia. A distinguished student, Saro-Wiwa was captain of the table tennis team and amassed school prizes in history and English. At Umuahia, he was the only student from Ogoni land but fellow students were mandated to speak English which made Saro-Wiwa feel Nigerian; he embraced the language as a useful way to communicate to a larger audience at home and abroad. On completion of secondary education, he obtained a scholarship to study English at the University of Ibadan. At Ibadan, he plunged into academic and cultural interests, he won departmental prizes in 1963 and 1965 and worked for a drama troupe. The travelling drama troupe performed in Kano, Benin Ilorin and Lagos and collaborated with the Nottingham Playhouse theatre group that included a young Judi Dench. He briefly became a teaching assistant at the University of Lagos and later at University of Nigeria, Nsukka. Saro-Wiwa was an African literature lecturer in Nsukka when the Civil war broke out, he supported the Federal Government and had to leave the region for his hometown of Bori. On his journey to Port-Harcourt, he witnessed the multitudes of refugees returning to the East, a scene he described as a "sorry sight to see". Three days after his arrival, nearby Bonny was liberated by federal troops. He and his family then stayed in Bonny, he travelled back to Lagos and took a position at the University of Lagos which did not last long as he was called back to Bonny. He called back to become the Civilian Administrator for the port city of Bonny in the Niger Delta and during the Nigerian Civil War positioned himself as an Ogoni leader dedicated to the Federal cause. In the early 1970s, Saro-Wiwa served as the Regional Commissioner for Education in the Rivers State Cabinet, but was dismissed in 1973 because of his support for Ogoni autonomy. In the late 1970s, he established a number of successful business ventures in retail and real estate, and during the 1980s concentrated primarily on his writing, journalism and television production. In 1977, he became involved in the political arena running as the candidate to represent Ogoni in the Constituent Assembly. Saro-Wiwa lost the election in a narrow margin. It was during this time he had a fall out with his friend Edwards Kobani. His intellectual work was interrupted in 1987 when he re-entered the political scene, appointed by the newly installed dictator Ibrahim Babangida to aid the country's transition to democracy. But Saro-Wiwa soon resigned because he felt Babangida's supposed plans for a return to democracy were disingenuous. Saro-Wiwa's sentiments were proven correct in the coming years, as Babangida failed to relinquish power. In 1993, Babangida annulled Nigeria's general elections that would have transferred power to a civilian government, sparking mass civil unrest and eventually forcing him to step down, at least officially, that same year. Saro-Wiwa's works include TV, drama and prose writing. His earlier works from 1970s to 1980s are mostly satirical displays that portrays a counter-image of Nigerian society but his later writings were more inspired by political dimensions such as environmental and social justice than satire. Transistor Radio, one of his best known play was written for a revue during his university days at Ibadan but still resonated well with Nigerian society and was adapted into a television series. Some of his works drew inspiration from the play. In 1972, a radio version of the play was produced and in 1985, he produced, Basi and Company, a successful screen adaption of the play. Saro-Wiwa included the play in Four Farcical Plays and Basi and Company: Four Television Plays. Basi and company, an adaptation of Transistor Radio ran on television from 1985 to 1990. A farcical comedy, the show chronicles city life and is anchored by the protagonist, Basi, a resourceful and street wise character looking for ways to achieve his goal of obtaining millions which always ends to become an illusive mission. In 1985, the Biafran Civil War novel Sozaboy was published. The protagonist's language was written in nonstandard English or what Saro-Wiwa called "Rotten English", a hybrid language of pidgin English, standard English and broken English. In 1990, Saro-Wiwa began devoting most of his time to human rights and environmental causes, particularly in Ogoniland. He was one of the earliest members of the Movement for the Survival of the Ogoni People (MOSOP), which advocated for the rights of the Ogoni people. The Ogoni Bill of Rights, written by MOSOP, set out the movement's demands, including increased autonomy for the Ogoni people, a fair share of the proceeds of oil extraction, and remediation of environmental damage to Ogoni lands. In particular, MOSOP struggled against the degradation of Ogoni lands by Royal Dutch Shell. In 1992, Saro-Wiwa was imprisoned for several months, without trial, by the Nigerian military government. Saro-Wiwa was Vice Chair of the Unrepresented Nations and Peoples Organization (UNPO) General Assembly from 1993 to 1995. UNPO is an international, nonviolent, and democratic organisation (of which MOSOP is a member). Its members are indigenous peoples, minorities, and unrecognised or occupied territories who have joined together to protect and promote their human and cultural rights, to preserve their environments and to find nonviolent solutions to conflicts which affect them. In January 1993, MOSOP organised peaceful marches of around 300,000 Ogoni people – more than half of the Ogoni population – through four Ogoni urban centres, drawing international attention to their people's plight. The same year the Nigerian government occupied the region militarily. 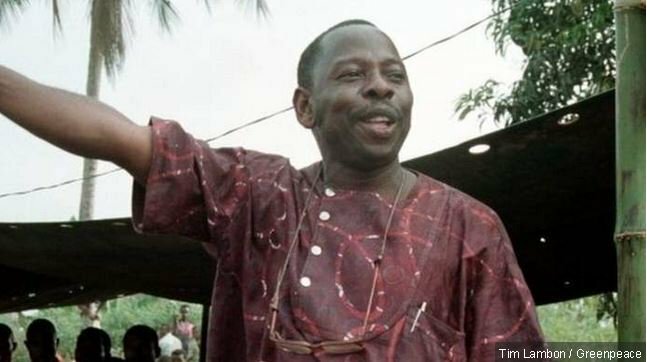 Saro-Wiwa was arrested again and detained by Nigerian authorities in June 1993 but was released after a month. On 21 May 1994 four Ogoni chiefs (all on the conservative side of a schism within MOSOP over strategy) were brutally murdered. Saro-Wiwa had been denied entry to Ogoniland on the day of the murders, but he was arrested and accused of incitement to them. He denied the charges but was imprisoned for over a year before being found guilty and sentenced to death by a specially convened tribunal. The same happened to eight other MOSOP leaders who, along with Saro-Wiwa, became known as the Ogoni Nine. Some of the defendants' lawyers resigned in protest against the alleged rigging of the trial by the Abacha regime. The resignations left the defendants to their own means against the tribunal, which continued to bring witnesses to testify against Saro-Wiwa and his peers. Many of these supposed witnesses later admitted that they had been bribed by the Nigerian government to support the criminal allegations. At least two witnesses who testified that Saro-Wiwa was involved in the murders of the Ogoni elders later recanted, stating that they had been bribed with money and offers of jobs with Shell to give false testimony, in the presence of Shell's lawyer. The trial was widely criticised by human rights organisations and, half a year later, Ken Saro-Wiwa received the Right Livelihood Award for his courage, as well as the Goldman Environmental Prize. On 10 November 1995, Saro-Wiwa and the rest of the Ogoni Nine were killed by hanging by military personnel. They were buried in Port Harcourt Cemetery.